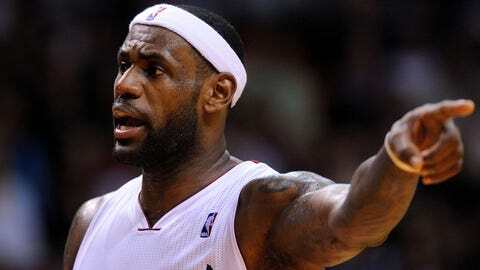 Heat star LeBron James leads the NBA with 1.076 million votes for next month's All-Star Game. NEW YORK (AP) — LeBron James and Kevin Durant lead their conferences in the latest NBA All-Star voting. Balloting for the Feb. 16 game in New Orleans ends Jan. 20. The starters will be announced Jan. 23, before the Lakers play the Heat. James leads all players with 1.076 million votes, though he’s fewer than 22,000 ahead of Durant. Miami teammate Dwyane Wade is also on pace to join LeBron in the Eastern Conference lineup, along with Paul George of Indiana, Carmelo Anthony of New York and Kyrie Irving of Cleveland. In the West, Kobe Bryant is second in the balloting, followed by Houston’s Dwight Howard, the Clippers’ Blake Griffin, Minnesota’s Kevin Love and Golden State’s Stephen Curry.